This is the first time I've actually bothered to log in and write a review. 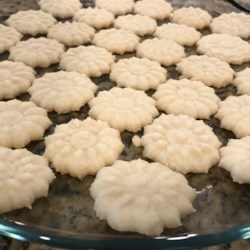 Oh man, these cookies are good. Yes, you should add a little confectioner's sugar to improve the taste and add to the "melt in your mouth" factor, as well as some brown sugar for moisture (I added 1/8 of each, 1/4 total). I also cut down on the flour. Thanks to the other reviewers, those few tweaks resulted in a blissful butter-sugar shortbread like cookie that can stand on its own. Normally my favorite cookies have chocolate involved, but honestly, these are so delicious I don't even miss it. (Hint - because this recipe is so simple, the quality of ingredients has to be good or it will ruin the flavor. I'd bet the majority of people who had issues with this recipe didn't use unsalted real butter, sifted flour, or real vanilla extract). Seriously, if you're having a cookie craving, give these a try. YUM! !